Here's one straight from the depths of left field. If you'll recall, Microsoft's co-founder Paul Allen was considering buying a bit of spectrum from the 700MHz auction after founding Vulcan Spectrum LLC. Evidently, the guy's bid ended in a win, but he's obviously not so keen on getting in on the flagging MVNO business. According to a document filed with the FCC, Allen has agreed to sell the licenses he owns -- which cover sections of Oregon and Washington -- to AT&T, though the carrier isn't disclosing financial terms. According to AT&T spokesman Michael Coe, the company is making the purchase to "meet customer demand and to support its transition to LTE." Unfortunately, Mr. Allen wasn't available to say what he was planning to do with the proceeds, though we did hear that one Kayne West was available to reiterate his belief that LTE was the best of all time. 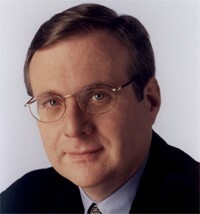 Microsoft co-founder Paul Allen sells LTE spectrum to AT&T originally appeared on Engadget Mobile on Thu, 17 Sep 2009 14:17:00 EST. Please see our terms for use of feeds.